I've made a new friend from the Yogurt shop here named Justin who just got his Dive Master License and it seems like he dives about 4-6 times a week. 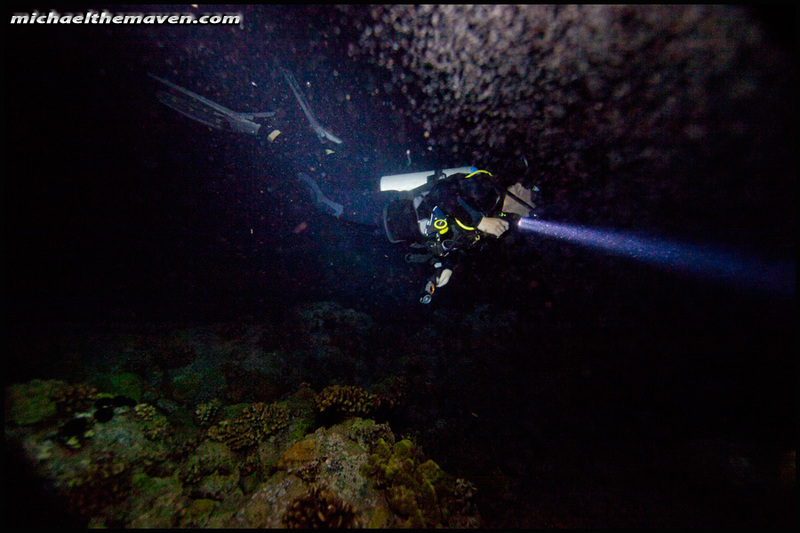 He invited me to join him for a night dive and I was all for it. 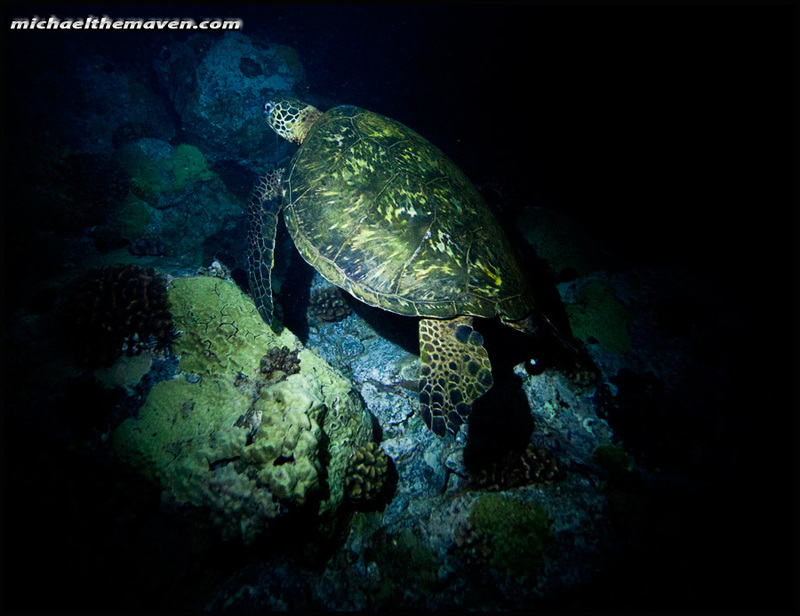 The only other night dive Ive been on was in Honduras several years ago- it is a completely different experience than day diving because the water loses all of that blue color and it feels more like you are floating in outer space. 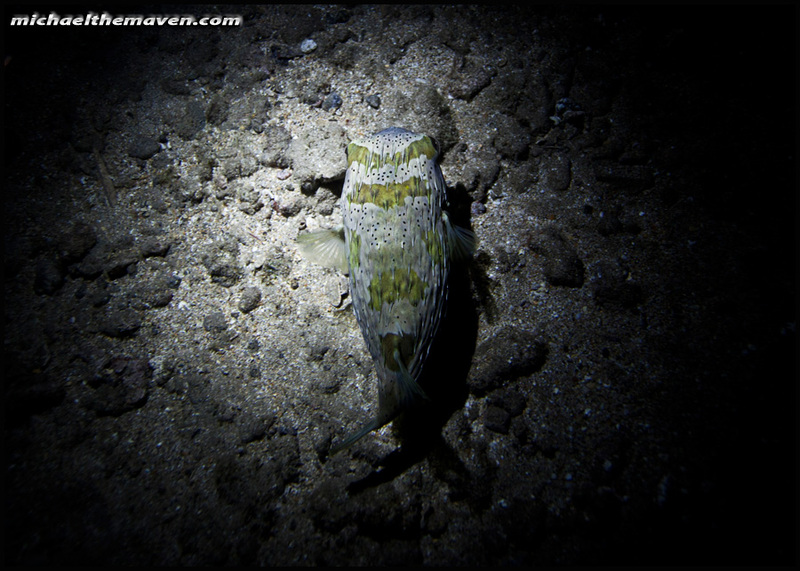 Night diving can be a little nerve racking because you can't see anything beyond what your light is showing, that said, it also seems there are many more interesting type creatures that come out hunting, so night diving is very rewarding. 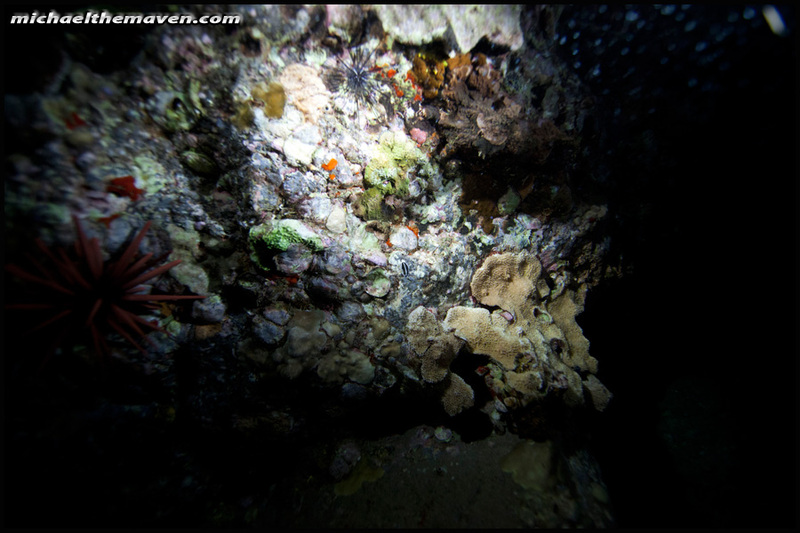 Photography when diving at night is also very problematic. I hate to say this but my brand-new Ikelite housing has been having quite a few problems. It works great above water, but under pressure, not so much. 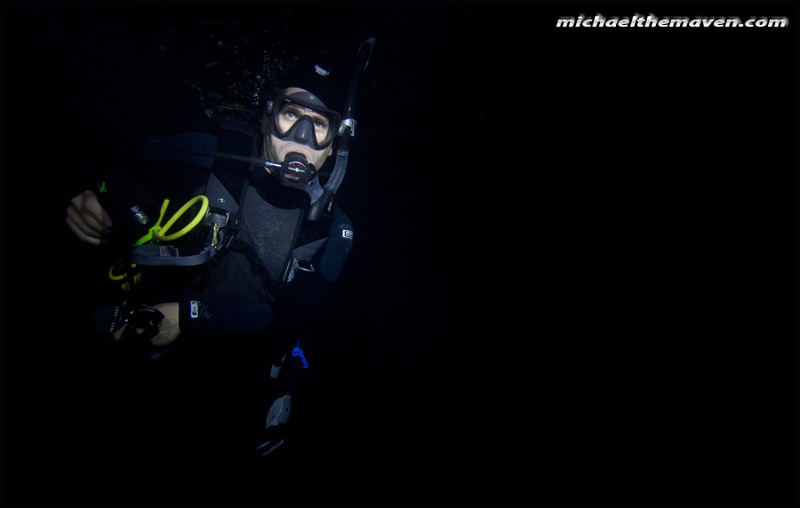 We did 2 dives last monday night, on the first, when I realized my strobes wouldn't fire, I decided to turn on the built in video lights, turn up my ISO a little and just shoot with the video lights. 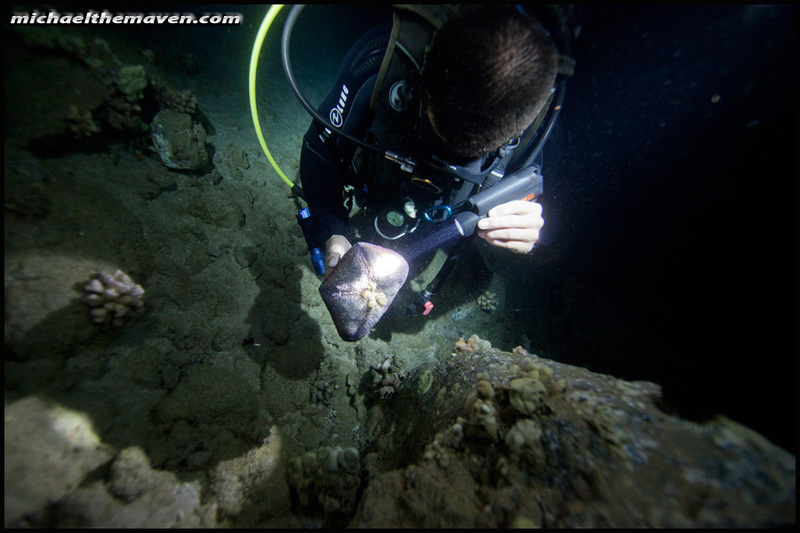 After the 1st dive, I broke open the housing, reset the strobe units, swapped cables- again, worked great on land. 10 minutes into the second dive they quit working. I've had the strobes stop working now no less than on 7 different occasions, so I sent it in last Friday with hopes they can pin-point the issue. Im not wanting to continue the troubleshooting, so if they cannot fix it, I will go with another brand. (Probably Subal). There is no good excuse for a that kind of expensive equipment to not work out of the box. Im pretty proud of this shot above. Handheld wearing all my scuba gear in about 30lbs of strobe and housing gear, f2.8 1/6(!). It was a beautiful night to get in. Water clarity was pretty good. This is an ornate Octopus. 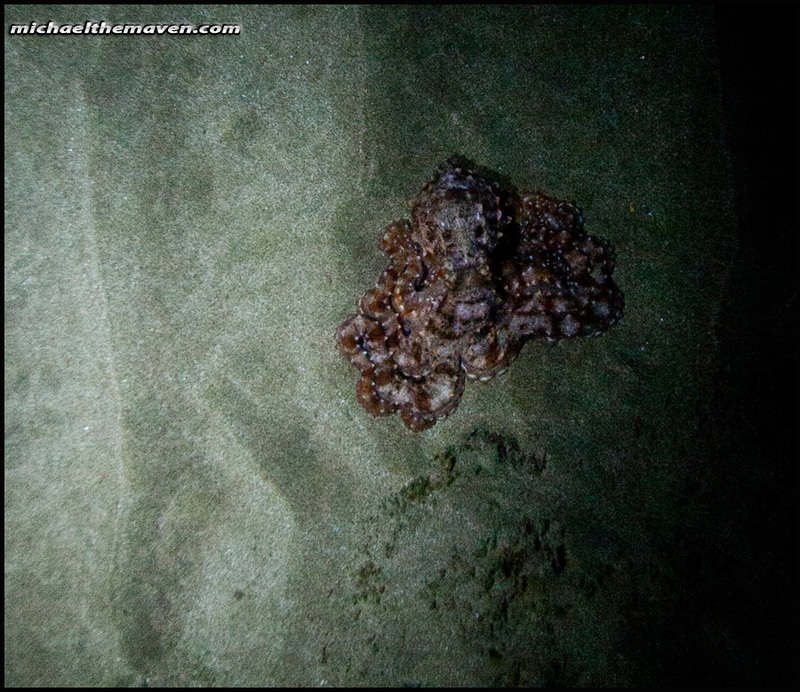 The way it walked was so freaking cool (sideways, almost like a crab). 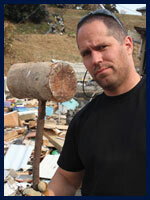 Here is Justin- he is extremely knowledgable about scuba diving as well as marine life. Justing inspecting the feet of a pin cushion starfish. The reef is teeming with life. 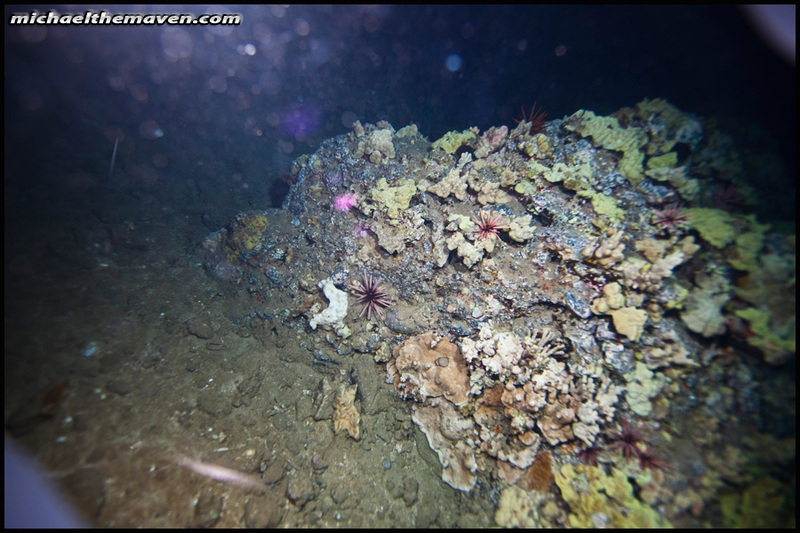 Note the red color of the pencil slate urchin on the left. 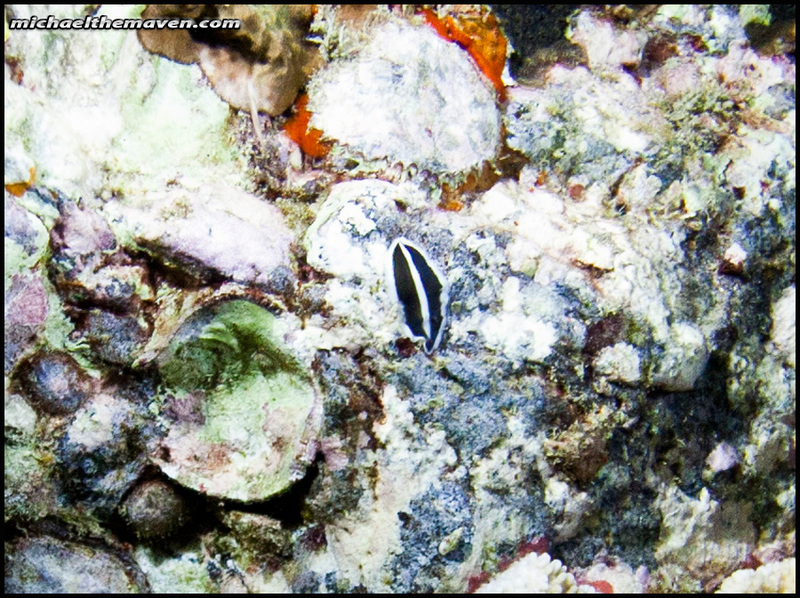 There are 2 different types of nudibranchs on this reef. Orange Gumdrop, and another...can you see it? Nudibranchs are essentially sea slugs, but their variety and color are really quite amazing. Its like finding an easter egg when you see one. Im trying to get pics of all the ones I see, but I had a very wide lens on that night (14mm 2.8) so I had to crop it out. Looking forward to getting my macro out there as soon as I get my housing back. 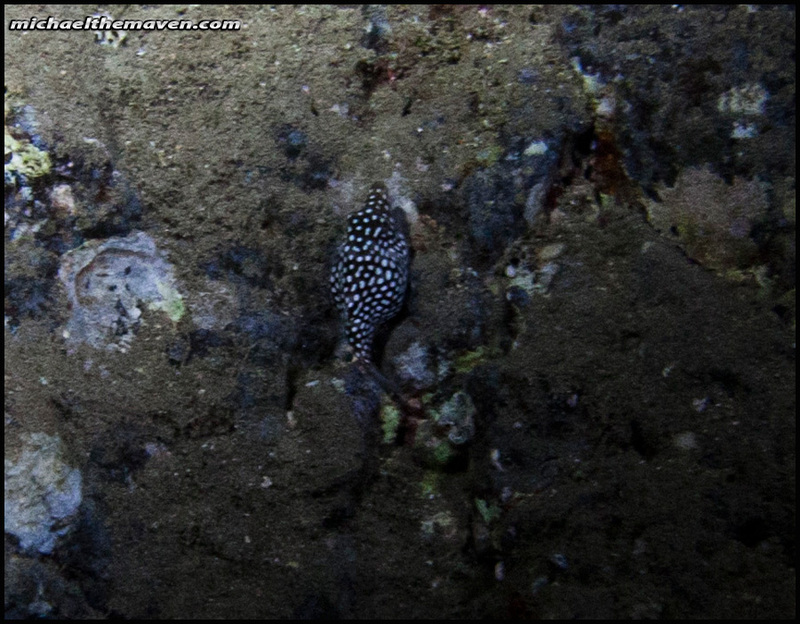 There were these little pufferfish everywhere! 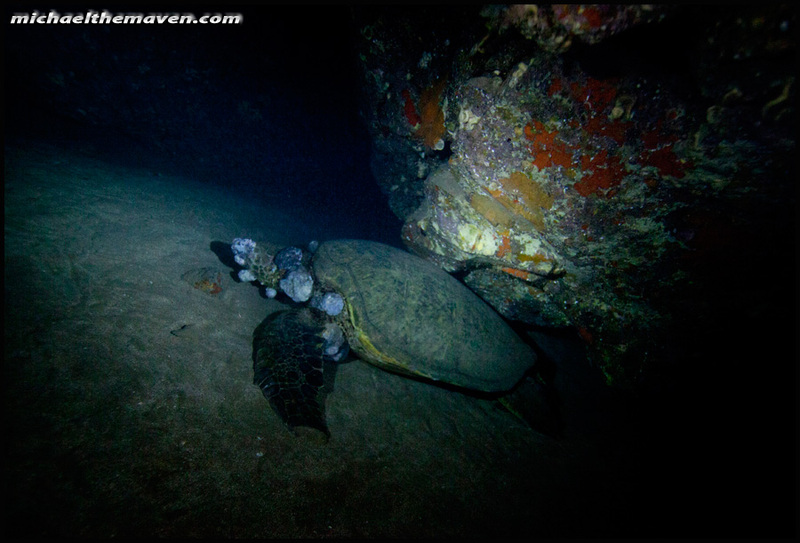 Went into the shark cave and there was this HUGE turtle in there, but his head was covered in tumors. Im amazed it has survived this long, because I am certain it cant see. Went to a place called the bubble cave, but there were other divers there so we couldnt get inside it. There were turtles everywhere though. Justin grabbed a couple shots of me. 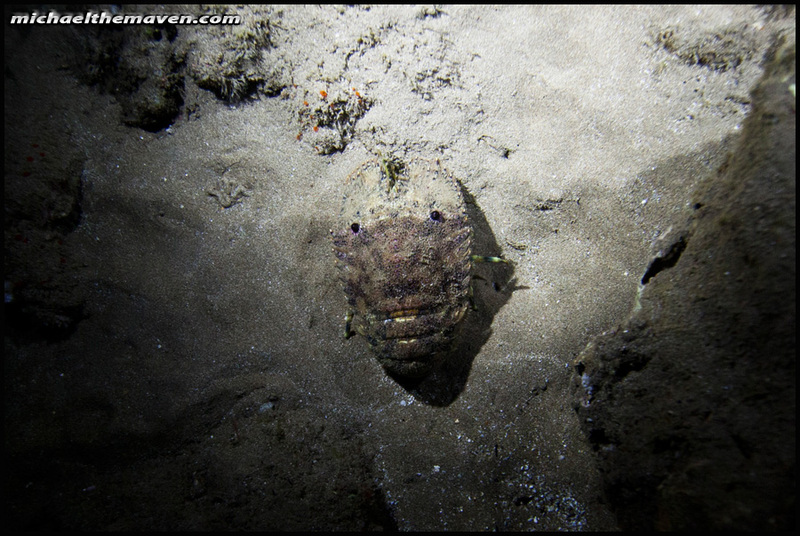 I invested in a backup underwater light, even though I have 2 very powerful video lights built into my set up. (3 lights total). Just has 2-3 lights as well. 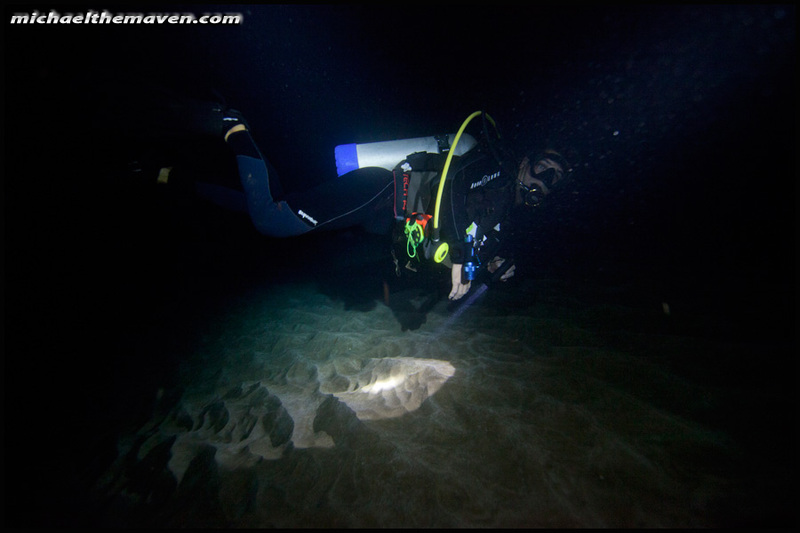 When we were in the shark cave, I realized...if all of our lights went out, we would be in serious, serious trouble as it would be completely dark and there would be no way to find our way out. For the most part, I have really good gear. 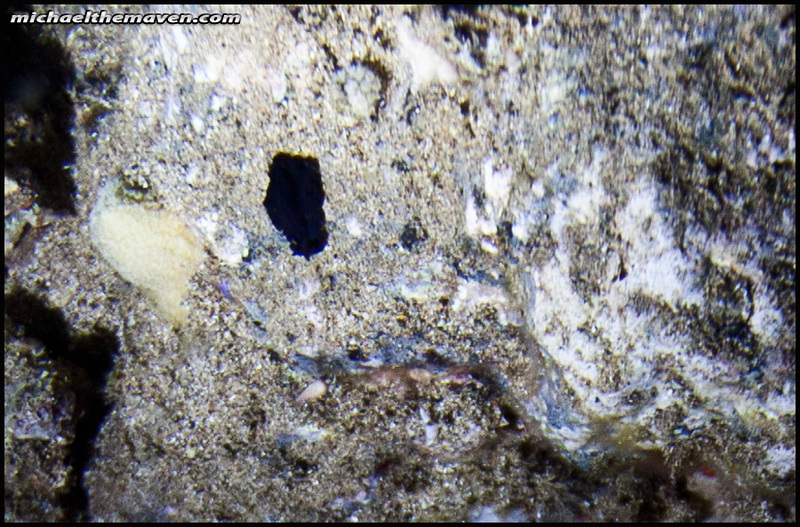 My BC has huge pockets and I store things like my light, underwater slate, tools, etc which I can reach in an grab. Ill be listing all my gear when I get some time to get caught up. As you can see...its pretty dang dark down there. 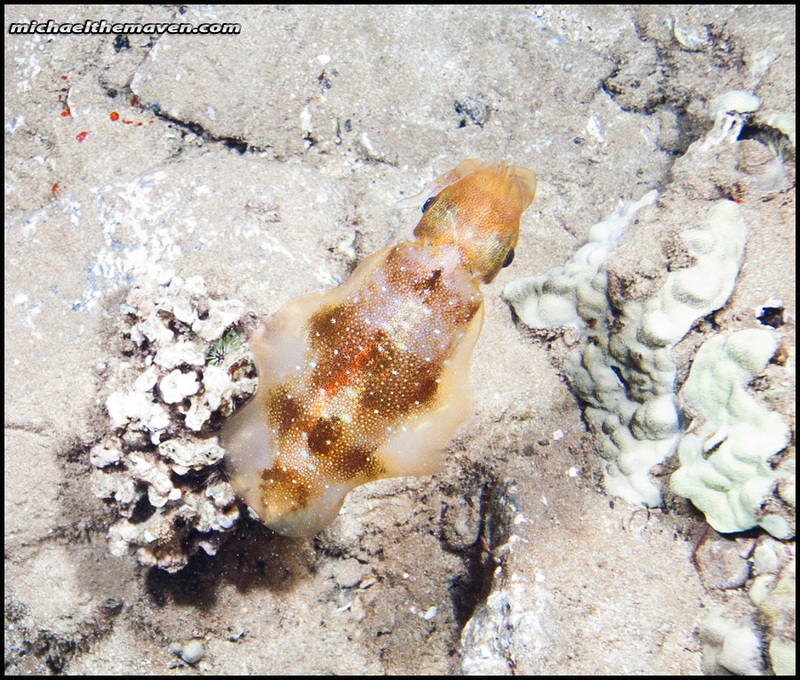 Yesterday, Justin was working (he works on a dive boat) and was out at Molokini (crescent shaped popular for snorkeling trips) and the group he was with saw this. 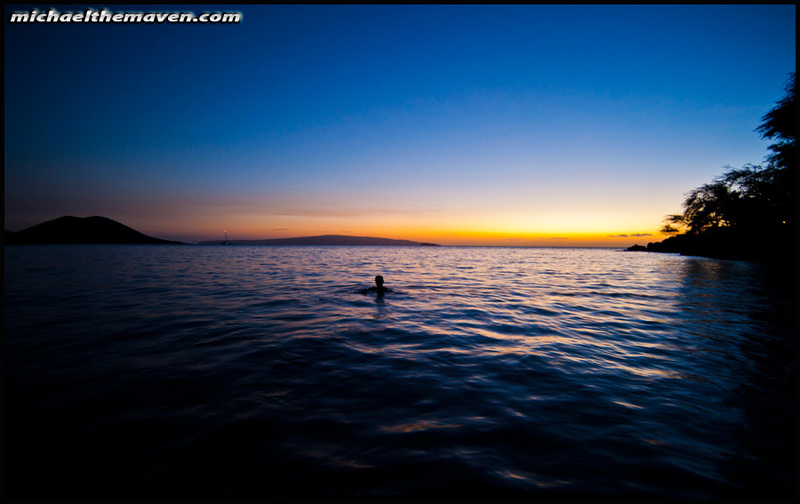 Molokini is 1-2 miles away from where we were diving. Justin said it was between 16-18 feet long. 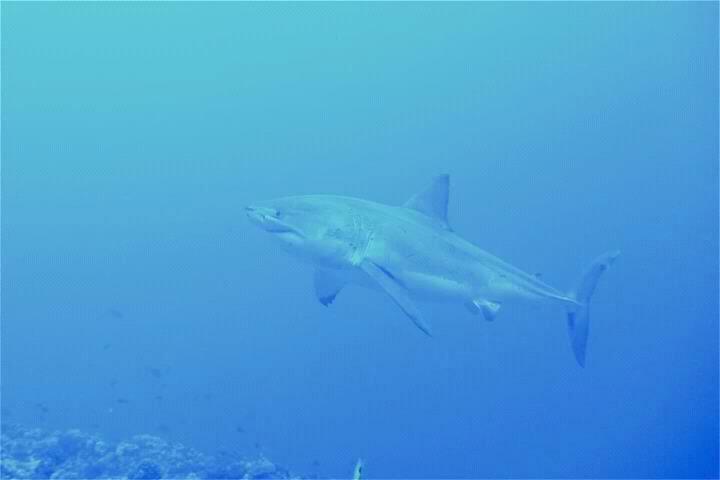 To me this is the grand prize of scuba diving, to see a huge great white shark in the open (extremely rare). Major props to the photographer/dive master David Fuller for being able to keep his wits together and get this great shot. Ricardo Tino did the editing.